I’m going to be giving the “Getting Started in P4” demo at Scaleforum next Saturday. That’s got me thinking about why I chose to get started in P4. I was taken by the view of model railway track, and also struck by the crudeness, in scale terms, of the mass-produced track. I’d always been aware of ‘finescale’ model railway standards, and started to look into them with more interest. Could I build track to those standards, and achieve something that would satisfy me more as a model? If I chose to stick with the 4mm/ft scale used by the OO models I already had, I had three choices – build finer track to OO standards, move to the EM standard, or use the P4 standard. I’ll hold my hand up, and say that at an initial glance, it can be hard for me to tell apart good examples of each. There are tell-tale signs, but I have to look for them. I was struck that once I ventured into hand-built track, there would eventually be a desire on my part to use finer wheels. In OO this seemed to be a can of worms – there are many subtly different tolerances between track and wheel, and choosing which to adjust to achieve the finer look I desired seemed to be a bit of a minefield. There are several documented OO ‘fine’ standards, and between them modellers I observed seemed to occasionally run into surprising difficulties with things that should work, but didn’t. Sticking to a well documented standard seemed to be the solution that people had most success with. Considering EM, the appeal seemed to be that it has high enough tolerances that some mass-produced models would ‘just work’ on the track after a minimal easing of the wheel gauge. Additionally, those larger tolerances might prove more forgiving to my ham-fisted modelling skills. As I looked further though, it seemed that there was very much a gradual process of rebuilding embarked on by the more successful modellers, to finer wheels, more flexible chassis designs, and therefore fairly tight tolerances in their models. So, to P4. Here I would probably need to worry about flexible chassis immediately, and would certainly have to work to the fine tolerances. I rapidly established that this was a matter of learning to use hand tools & jigs well, which didn’t seem beyond my ability. There was also the advantage of a single standard, rather than several interconnected ones, and that appealed to me. Given that both the other ‘fine’ approaches to 4mm/ft models seemed to end at hand built track and stock – with the better models having flexible chassis – there seemed to be no particular advantage to either a ‘fine’ OO or EM, when compared to P4. Either way, I’d need to learn to build track to fine tolerances with jigs, and eventually need to build quite complicated chassis. Given those conclusions, choosing P4 meant my models would be closest to scale. 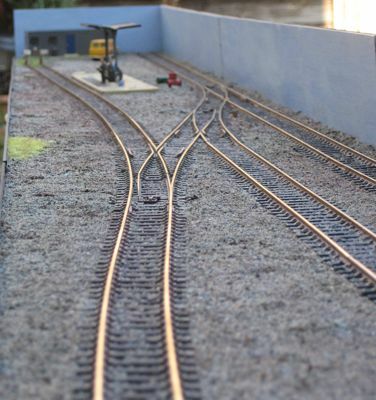 Additionally, P4 had the easiest route into hand built track, with the ridiculously easy to build Exactoscale Turnout Kits – so P4 seemed the best choice for me. This entry was posted in P4 on September 20, 2014 by John.